This summer I have decided to try to learn to make really good bread. I have vowed not to buy any bread and just bake what my family needs (I am hoping they go along with this as I haven't actually told them yet). I am going to try out different types of bread, different methods, and different flour. For the beginning of my bread adventure, I am going to rely mainly on the instructions given by Sebastien Boudet in his book "Den Franske Bagaren" (the French Baker). Those who live in Stockholm might have eaten at Broms on Karlavägen where he started the bakery. The fine crusty breads they have are his work. buying the normal flour, I have invested in Wapnö wheat flour. Wapnö is a farm just 40 minutes away from us. They are mainly a dairy farm with the happiest cows in the world (we always drink their milk when we are at our summer house) but they also do a little of this and that and we try to support their business by buying what products we can. 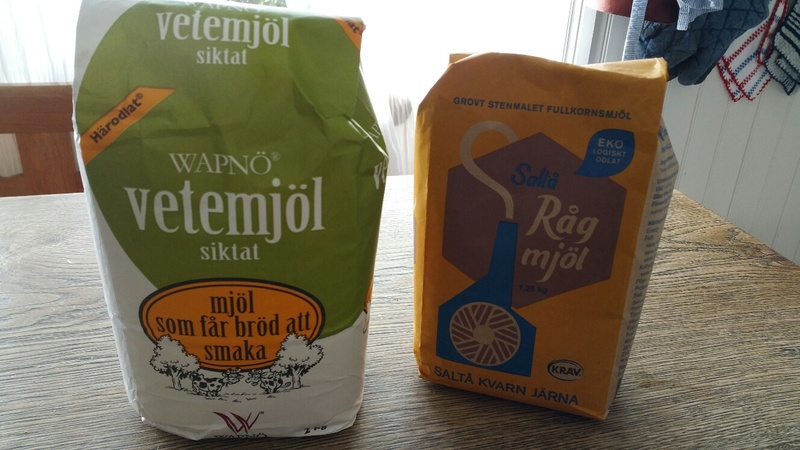 I have also bought rye flour from Salta Kvarn, which is a smaller mill, which we pass every time we drive to our summer house from Stockholm. Mr. Boudet wishes that everyone would visit the mill that their flour comes from in order to ensure the quality. Later in the summer, I would like to do some taste testing to see how much a difference I can detect in the flour. Mr. Boudet also firmly believes that while yeast has its place, a really good tasty bread needs time and a sourbread starter. All of his breads take a minimum of two days, and most take three. So, clearly patience is a key compenent of bread. I doubt that I have ever been accused of being patient, but the slowness of this process is just what I am after for the summer. 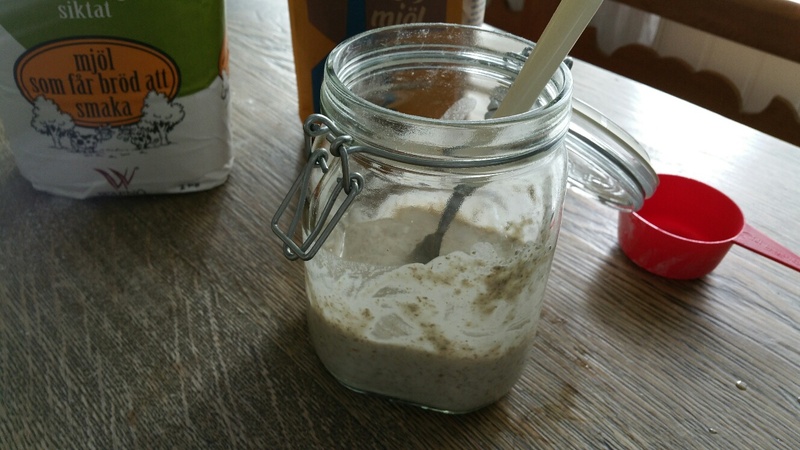 So, today I am beginning the 5 day process to make my starter. 1/2 dl each of wheat and rye flour. Stir until all the flour is combined and you have a smooth consistency like a pancake batter. Put a platic bowl over the jar and let it stand in a warm part of the kitchen. Presumably the bowl is to keep bugs and other icky things away. For the next three days, I will be feeding it every day with more water and flour in the same proportions. I will report back. The reason that I use both white and rye flours is, well, because Mr. Boudet said so. 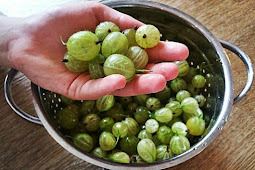 But I have read, and Mr. Boudet confirms, that you want to have as many little microrganisms in your starter as possible. So ideally, you will use different kinds of flour. Further, you want to definately use the kinds of flour that you will bake with. As I intend to mainly use wheat and rye, then these are the ones I started with. 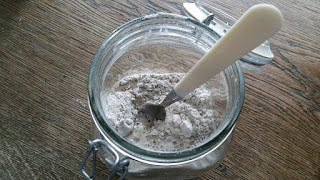 Later I want to try dinkle flour, which is an old fashioned wheat variety as well as some semolina. 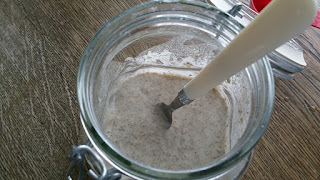 Once the starter is ready, then I am going to make a levain which is a breaddough that takes 5 days to make. Then from this levain dough, I will make bread and save some of the dough to use as a starter for the next bread. You can also use the sourdough starter instead of the levain. If you are not making bread at least every other day, Mr Boudet informs me, then it will be better just to use the starter as the levain will go bad. Bread every other day sounds a bit much for our family, but I have lots of neighbors who I am sure wouldn't mind taking care of some of my loaves, assuming that they are any good. While I wait for ten days, I will be making some other things, among them a baguette which uses regular yeast only takes two days and from which Mr. Boudet makes other things like pizza. I think the biggest test of this will be whether or not I have enough endurance to bake bread every other day, when I could be lying in the garden or on the beach sleeping.